The Similan Islands are an archipelago consisting of 9 islands situated 64 kilometres (38 miles) from the mainland in the Andaman Sea off the coast of Phang Nga Province in southern Thailand. 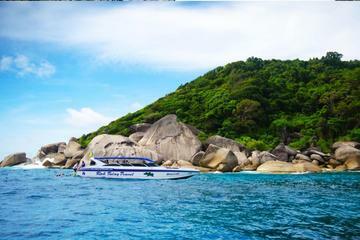 The islands, including two others located further north between the Similan chain and the islands shaping the Ko Surin National Park, form part of a National Park established in 1982. The two northerly islands are called Ko Bon and Ko Tachai and are the preferred turf of choice for whale sharks and manta rays. To name the nine main islands in a descending order, they are Koh Ba Ngu, Koh Similan, (the largest) Koh Payu, Koh Payoo, Koh Ha, Koh Miang, Koh Payan, Koh Pahang and Ko Huyong. A word of note here and that is these islands may not offer the best beach destination in Thailand, but they have been voted one of the top ten diving and snorkelling sites in the world. You can hardly argue with the sheer underwater beauty of the island's magnificent coral reefs and brilliant crystal clear turquoise waters. Visibility for up to 30 metres is not uncommon. It's certainly the ideal destination for exploring marine life in all its natural glory. The Gigantic Grey Boulders that one can see surrounding the numerous islands here certainly sets the pace for its unique and distinctive character as does the superb dive sites that draw thousands of divers to its shores every year. The east side of Ko Surin National Park, famous for its dive sites, consists of coral reefs in a relatively lenient form of gradient interspersed with sandy spaces and intermittent with occasional boulders. The best east side dive site is the one at East of Eden located on the south-east coast just off the island of Koh Payu. The west side of the park, however, consists of many underwater breakthroughs where one can dive between enormous granite boulders. The best west side dive site is the one at Elephant Head Rock, located one and a half kilometres to the south of Koh Similan Island. The dive site is a maze of swim-throughs with a reputation for spin-cycle like currents running in all directions. The underwater marine life and scenery around these islands is nothing short of spectacular if not simply overwhelming. The reefs teem with an abundance of life from the long-nosed and red-tail butterfly fish, checkered snapper fish, Indian triggerfish, black, yellow and white striped angelfish, yellow box fish, frog fish, purple and turquoise parrot fish, yellow goatfish - the list goes on. Further, a field there are turtles, manta rays, octopus, moray eels, leopard sharks, white and black tip sharks, sea snakes, barracuda, enormous tuna, giant lobster, mauve and burgundy crown-of-thorn starfish and red grouper fish. Koh Payan, Koh Pahang and Koh Huyong islands are closed to the public due to the turtle hatching protection program and reef conservation. Although fishing is forbidden around the national park, fishing boats are constantly seen here. Getting to the islands can be quite simple enough should you wish to go diving or snorkelling around some of Thailand's best coral reefs. A variety of boats including luxury cruisers depart daily between the months of November and May each year from Thap Lamu Pier conveniently located eight kilometres from Khao Lak. Transport is limited during monsoon season - June and October. Most trips include up to four island stopovers with the first being at Koh Ba-Ngu. Public departure from the pier is at 8:30 am and arrival at the first island is just under two hours. Boats depart the islands around 3:00 pm for the return trip. As an independent traveller, you can make use of long-tail boats to explore some of the other islands and different coral reefs. Should you wish to stay overnight in one of only a few bungalows on Ko Miang island for a day or two, you can always make use of the same boats for your return transfer. Advance booking is essential for this accommodation and can be arranged at the national park office near Thap Luma Pier. Another excellent alternative which will allow you to view the best reefs away from the crowds before and after their package tour ends is that some sleeping arrangements can be accommodated with live-aboard diving and snorkelling trips. Purchase one day and overnight snorkelling packages from various travel agents in Khao Lak, Phuket and Phang Nga. Prices range from 2,500 Baht to 4,500 Baht. Come and enjoy the best place for snorkelling in Thailand with a chance to see a huge variety of marine life and relax on beautiful beaches with this full day tour from Phuket by speedboat. Lunch is included. See more details in the link above.